You may be wondering about me - why am I visiting all these craft distilleries and taking such an interest in the spirits they produce? No, I haven't turned into an alcoholic although I have yet to find a gin I don't like! The other part of this is Ryan. The last few times he has come up to visit, we have done self-drive tours of the cideries and farms. And the last time was a stop at Seattle Distilling Company on Vashon Island. In our combined wisdom, we came up with the idea of a small tour company to take people to the distilleries on this side of Puget Sound, meaning west of Seattle. There are several tours operating in Seattle and surrounds, but none over here. My part of the deal was to visit the distilleries and check out whether our idea will work. And yes, it will! The website will be live in the next day or so, with plans to start operating the weekend after Memorial Day, and go through October. There is still a huge amount of organizing to do, but what fun! Susan and I visited two more distilleries last weekend and what a good time we had! I even tried moonshine and it just about bit my tongue off! Not my favorite, that's for sure. There are a total of five small batch, craft distilleries this side of the Puget Sound; Seattle Distilling Company on Vashon Island, which I went to with Ryan; The Hardware Distillery Company, which we visited a couple of weekends ago, Bainbridge Organic Distillers, Tucker Distilling and Heritage Distilling Company in Gig Harbor. The tour will visit three of them and take about 6 hours, not counting the ferry ride if guests are coming from Seattle. So it's a whole day - tasting and sightseeing! Even though we had been out to Hoodsport the previous week, we made the drive again, this time coming from the southeast, driving a route I have never taken before. It is absolutely spectacular! Although it wasn't very warm or sunny, seeing all the blossoming trees and flowers as we drove along the Hood Canal's southern shoreline was definitely worth it. It was low tide, and the beaches were loaded with acres of oysters which this area is famous for. Houses line the waterfront and several tiny communities hang on beside the road and almost every one has an fresh oyster store! Probably 70 percent of the houses look like they are out of the 40s and 50s. The rest are new and big and glitzy so it won't be long now before they tear down all the little character houses and replace them with MacMansions. Such a shame! Twanoh State Park is right on the shores and that is where we will stop on the tour for a picnic lunch, which we will provide. We made a quick stop at The Hardware Distillery and headed back towards Silverdale to visit Tucker Distilling, which is very new, tiny and located in an industrial park. Jason, the young man who poured for us, gave us a quick tour and then we tasted! Moonshine aka un-aged corn whiskey! Yikes, that stuff will burn a hole through your cheeks if you aren't careful! But I did like the Corn Vodka. I am the gin queen and have never liked vodka, but as they don't make my favorite spirit, I tried the vodkas and was pleasantly surprised! Next stop, Bainbridge Island and the distillery there. What a great space they have! Open and spacious with great displays of their wares. I have had their Organic Fir Gin before. I actually took a bottle to Ryan one Christmas but he didn't care for the piney flavor, but I can guarantee it didn't go to waste! So I decided to try the current award-winning, organic Madagascar vanilla infused vodka and it is very good! Olivia, our pourer, gives very healthy tastings! We toured the distilling area and could see the huge fermenting tanks - three in various stages of fermentation, which make the whole place smell like baking bread. Two tastings in one afternoon was enough for us so I put off Heritage Distilling until another day. 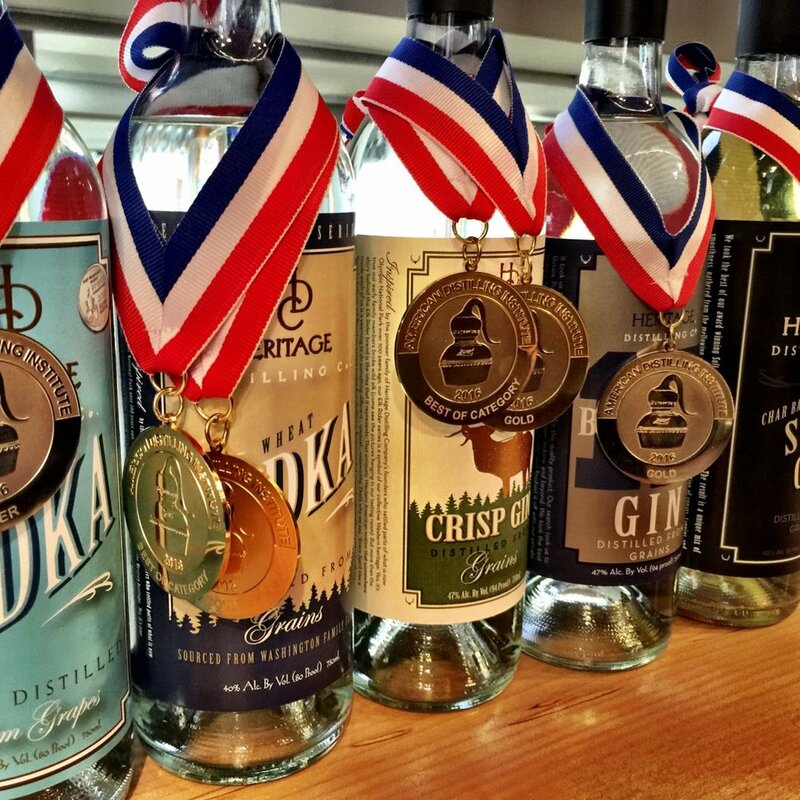 Heritage Distilling Company in Gig Harbor is impressive. It is the most award-winning distilling company for the third year in a row. Although I didn't do any tasting, as I was there in the morning and for me, it was a bit too early, it is definitely going to be one of the three stops on our tour. Maybe next weekend, when Ryan comes up and we "run the route," we will do a little tasting! Stay tuned for the new website - booking and everything will be online. Tomorrow I have training on the installing the booking engine through Zozi, a huge company that promotes tours around the world and is backed by Sir Richard Branson! Once that is in place, we will be live and hopefully, flooded with bookings!